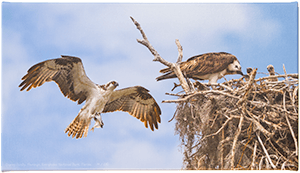 We were on a trip to Everglades National Park in the spring to check out reports of great horned owl chicks in the parking lot of the Coe Visitor Center, but then we went on to Flamingo and discovered a few osprey (Pandion haliaetus) nests also. This one was in a short snag right in the parking lot next to the tent campground. 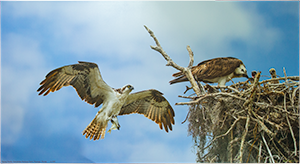 The nest was only 15 to 18 feet high but from the ground we could barely see the top of the chick's heads, so Nancy balanced on top of our old 17-foot aluminum Grumman canoe (with the small keel right down the middle), on top of the van to get a better perspective. She was taking pictures of the one parent and chicks when out of the corner of her eye she saw the other parent approaching. She didn’t have time to change from the One-Shot Autofocus mode (for still objects) to the AI Servo mode (for moving subjects), or from the Single shooting drive mode (where each press of the shutter button yields one shot) to one of the Continuous shooting drive modes, or to zoom out and recompose the shot; she just swung around and captured the flying bird, with fish, as it was about to land. Needless to say, this is a composite. 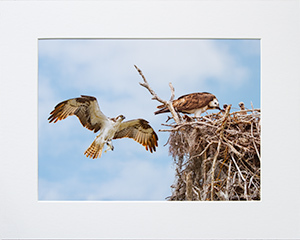 In one photograph we had a close-up of one parent feeding it's chicks on the top of the nest. 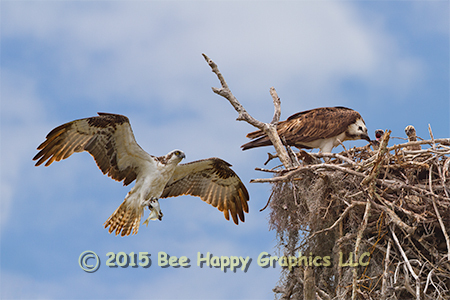 The next photograph shows the flying osprey and the left portion of the nest. Still another photograph shows the lower portions of the nest. Because the camera was hand-held, which allowed more positional freedom than a tripod would have (had a tripod on the canoe even been practical), and because of the nearness of the three-dimensional nest, the parallax was significant, meaning the relative position of the branches in the nest looked different enough in the various images to require hand-stitching by using masks on each image to weave the twigs and branches of the nest back together again. 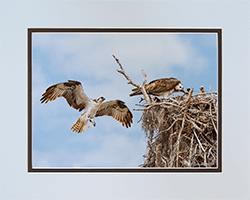 Had Nancy had time to zoom out to get the whole scene in one frame, the image would have looked essentially the same, but wouldn't have had the resolution and details it needs to print so large. Possible moral: sometimes it's best that God doesn't give you too much time to think and screw things up. And although for the technical support staff (me) this was our most difficult image so far (Note: this title has now been passed on to Eclipse Over Long Pine Key), at least I wasn't the one risking my life to get the shot. And for those critics who demand that a wildlife photograph be thrown out if the subject's eye isn't crystal clear, regardless of the other merits of the image, you might notice that every eyeball in this image is sharp, even the one being passed from the parent to the chick. Epilogue: Hurricane Irma took out the tree and nest in September 2017blog. Photographic details: Canon EOS 7D camera w/ EF 100-400mm f/4.5-5.6L IS USM lens set at 400mm. Camera was on f/8 for 1/750 sec at ISO 200. Fine Art Paper 11" x 15" 37" x 53"